After a bowl of porridge (well it was there!) 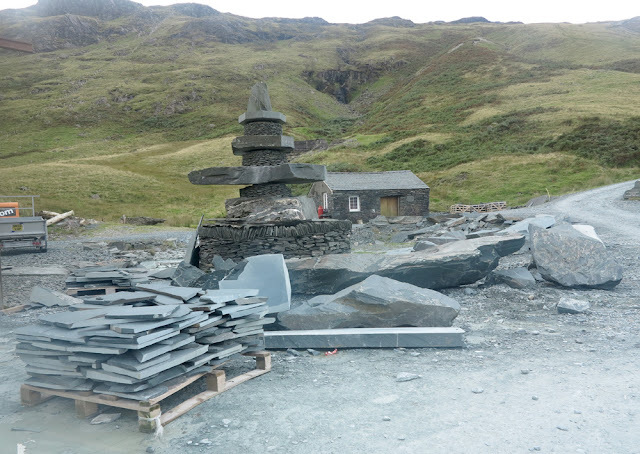 and a ‘Full English’ at the Royal Oak we said goodbye to Spot and set off to Honister slate mine where we dropped off one car. Then on to Ennerdale Bridge in the other car to the start of today’s trek. Honister is 12 miles away. It’s varied scenery - the walk goes past a long lake, follows a lengthy forest path and snakes into the fells through some of the remotest parts of Cumbria. We were well prepared and it was a clear day with no rain forecast until 5pm. What could possibly go wrong? 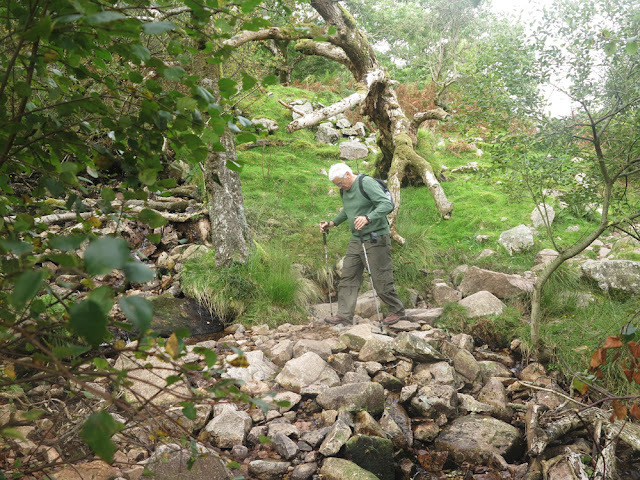 The path alongside Ennerdale Water is very rocky (see photos) with plenty of potential for turning an ankle. Having said that, it’s a really pleasant walk with no chance of getting lost (just keep to the lakeside). Bob pressed on whilst I took photos. At one point I noticed a small pile of stones (a mini-cairn) that a previous traveller had carefully erected. It reminded me of Neist Point on the Isle of Skye where there were dozens of them (see my Hebshots blog). 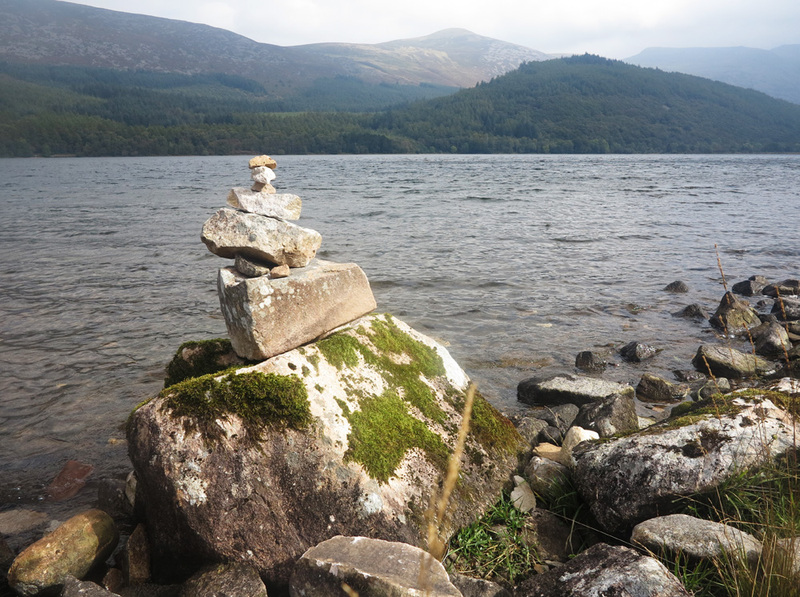 I added a couple of small stones to the top before catching up with Bob. The lake is 2 ½ miles long. When we reached the end I suspect that we missed the trail to the forest, which we could see across the fields, because we had to hike across one field occupied by bullocks. There was no reason for concern - the creatures were docile and showed little interest in the two intruders. 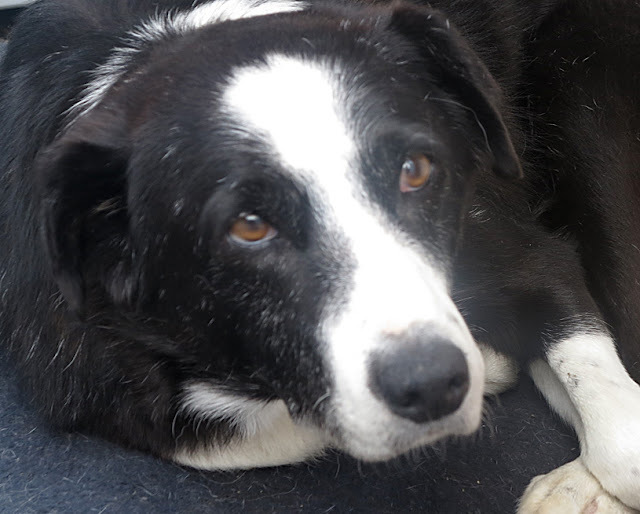 Just as well – I would have put on a dash if necessary but Bob told me that he wouldn’t be able to run! 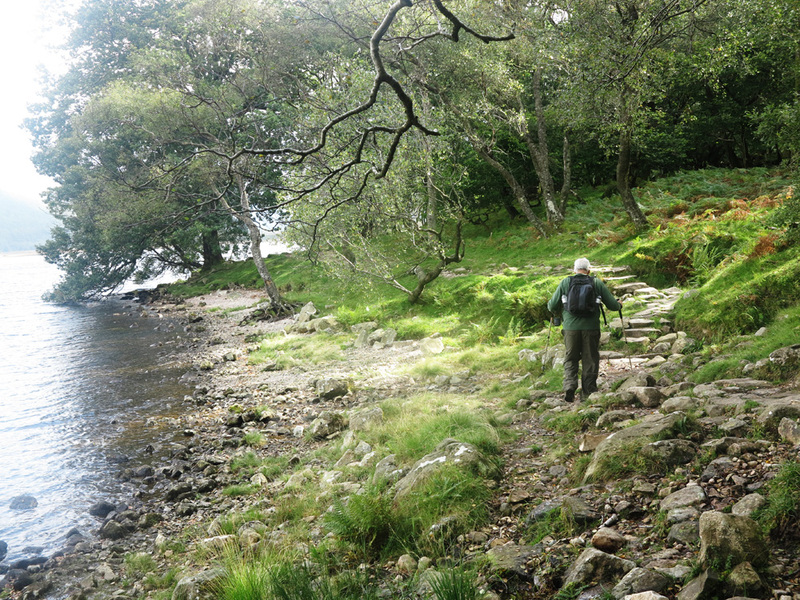 The Ennerdale Forest path was long – maybe about 4 miles – but very well maintained and a pleasant change to the rocky route along the lake. 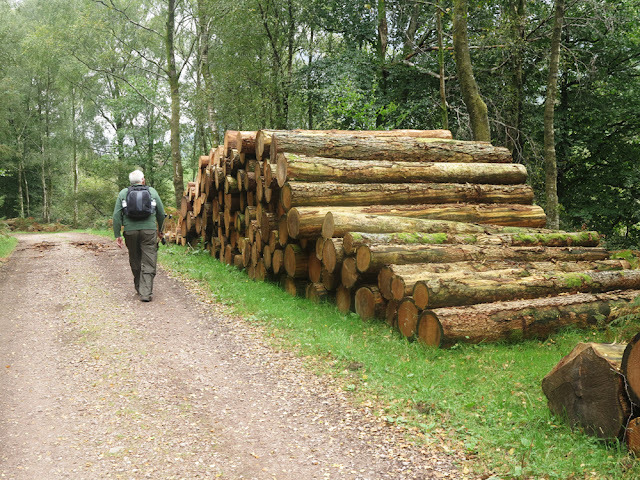 There had been lots of forestry management – evidenced by the large, neatly stacked piles of tree trunks which lined a good portion of the route. 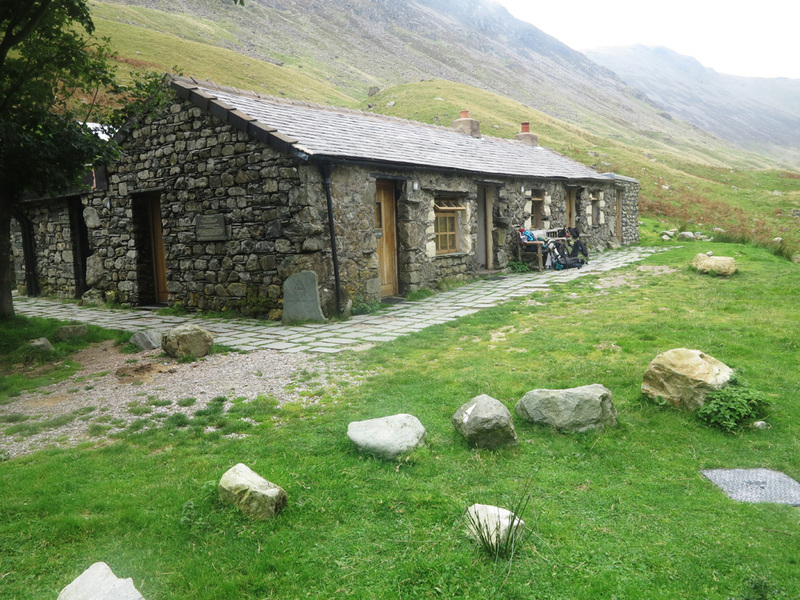 We passed the Youth Hostel at Gillerthwaite and continued for a while longer until finally emerging from the forest at the isolated Black Sail Youth Hostel. Formerly a shepherd’s hut, Black Sail is described in Wainwrights C2C guide as ‘the loneliest and most romantic of hostels situated in a magnificent surround of mountainous country’. 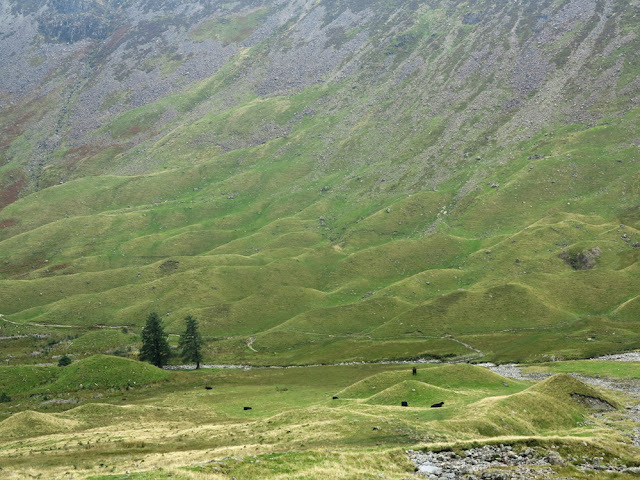 To the south-east of the hostel are a group of fascinating hillocks – they are actually called drumlins and were formed by glacial movement acting in the direction of an ice flow. A group of them is called a drumlin swarm (how’s that for a delightful and unexpected snippet of geological detail?). As we were climbing out of the valley I took a few photos of the ‘swarm’ – I’d have been better advised to take more notice of the map and the guide! On we went – higher and higher. At one point we had to clamber up a small rock face – this should have signaled to me that we were no longer on a ‘walk’. I went first then Bob chucked up his poles and scrambled up himself. It wasn’t too tricky but if either of us had fallen there could have been a broken limb to deal with. How would that have been resolved with no one around, no phone signal, no way of returning or continuing? We press onwards and upwards – getting quite high now. The wind is now fairly strong and we are about an hour away from the promised rain (it’s coming all right – the clouds are looking blacker by the minute). Still we climb. We both agree that we are probably lost now. There are only dark, ominous mountains in all directions – the prospect of spending the night high up in the fells begins to emerge. The wind is now very strong and it’s getting cold. We probably only have a couple of hours of daylight left. We haven’t seen another soul since the far away Black Sail YH but our luck finally changes. A party of walkers can be seen in the distance – they are coming our way. I’m heartened to see that the leader looks like he knows his business. I ask him if we are on the right route for Honister – he is taken aback by this and shows me on his map that we are travelling in completely the wrong direction. 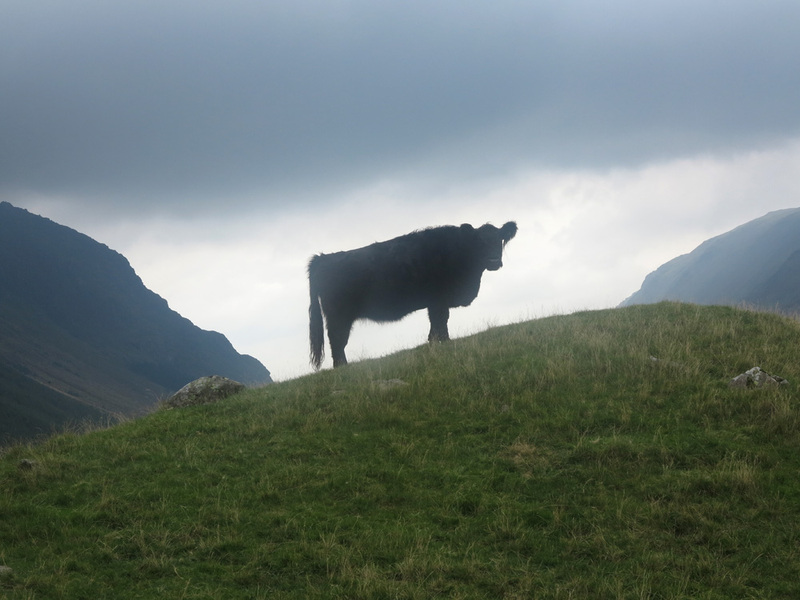 Bob has stopped to get his anorak out of his rucksack – it’s now very cold and the rain is imminent. The leader tells me that we need to retrace our steps to Black Sail and then pick up the right route. 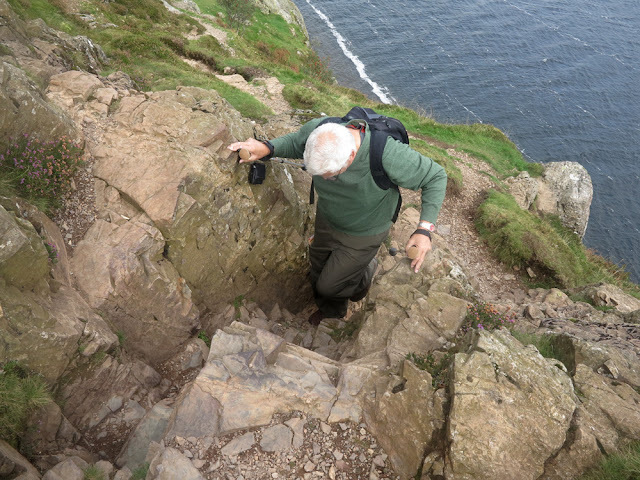 Neither Bob nor I fancy climbing back down that rock face – or the long descent to the distant hostel. Bob is trying to put his anorak on – the fierce wind is whipping it furiously in every direction – it would be very funny in any other situation, but this wasn’t the occasion for hilarity. I ask the guide if he thinks we would be able to spend the night at Black Sail – he tells me it is full! 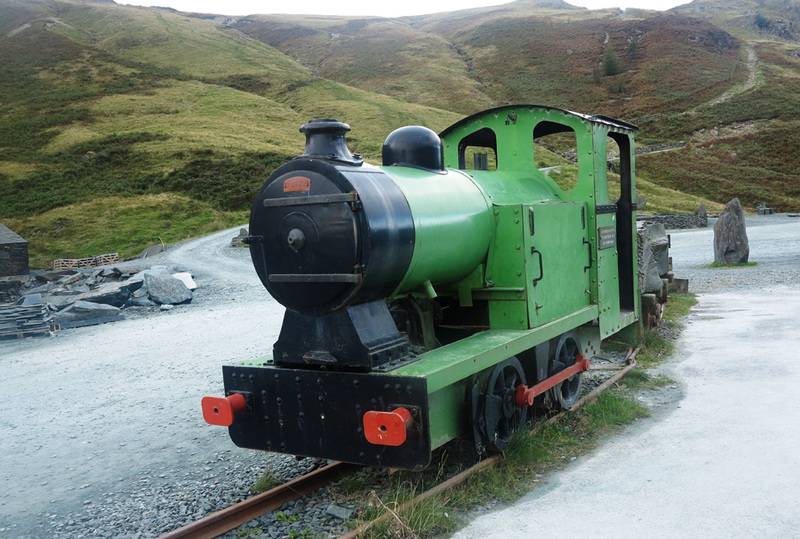 I ask him how long it would take to get to Honister if we did go back down. He says that we wouldn’t be able to make it in daylight (I know that really). Bob has somehow managed to get into his anorak. Finally, I ask where is the nearest place we could reach before dark where there would be some accommodation. 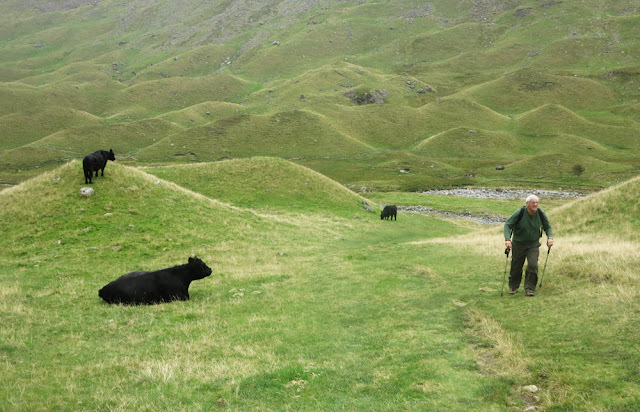 The guide points out a far off path that we could pick up which would take us into the small village of Wasdale Head if we follow it for about 3 miles. There is a pub in the village – that's good enough for me. I tell Bob that we can follow the walkers down to where the path joins – we agree that there is no other option. It is 5 o’clock and has now started to rain – the BBC Weather forecast has been spot on. The rain had made the rocky path slippy and it took us about 90 mins to reach the Wasdale Head Inn (what a welcome sight it was!). We had walked about 15 miles since we set out in the morning. The pub locals must have been very amused to see two thoroughly soaked, bedraggled figures splashing into their pub. We were beyond wet but at that point we were also beyond caring. I ordered a pot of tea and asked for the use of the phone (no signal on the mobile). The barmaid gave me a number to ring for a taxi. I booked one to take us to Honister where we could pick up a car. We would have to wait 20 mins - that was fine. We now knew that we would get home that night. (I made it back to Cheshire for midnight). Reading the Trailblazer guide the following day I saw that I had completely missed their note which said ‘ATTENTION! PATH GOES OFF EASTISH FROM YH. DO NOT TAKE THE MUCH MORE OBVIOUS PATH HEADING SOUTH-EAST’. 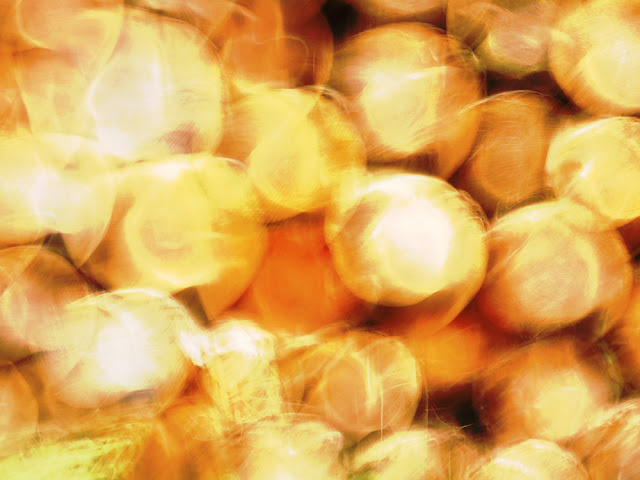 If I’d been looking for that other path I would surely have found it. I couldn’t be more annoyed with myself. Although Bob was fine about the whole thing, we both know that I made the wrong call at Black Sail. We will continue the adventure in the spring – starting again at the drumlin swarm.